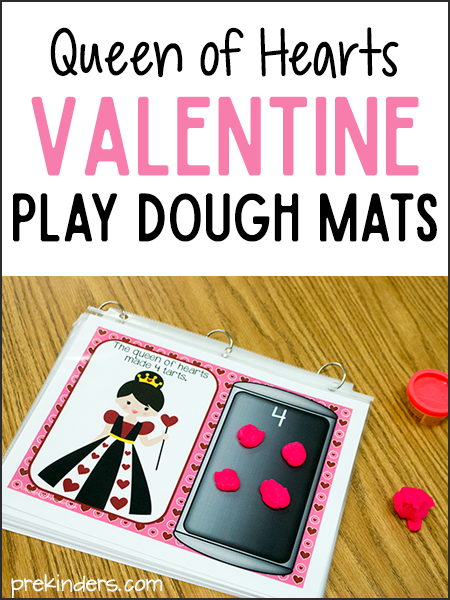 Here are some Valentine’s Day Play Dough Counting Mats that will help your prekinders practice math and fine motor skills during your Valentines theme. You can find more counting mats on my play dough math mats page. I decided to create these mats with The Queen of Hearts since my class learns the nursery rhyme during February. With my class, I print these mats on card stock and slip each page into a clear page protector. I hook them together using metal binder rings like a flip book. You could also laminate the pages if you prefer. Each mat says, “The queen of hearts made [#] tarts.” Children will identify the numeral on each page, and count out the correct number of “tarts” to place on the little baking pan on the mat. The children can shape these like little hearts or just little circle shapes if hearts are too difficult to form with the play dough. They can roll the play dough into a little ball and then smush it like a cookie. If children do not understand what a tart means, just tell them to make mini pies or little candies or something similar. Some teachers like to save ink by not printing out the full set of counting mats 1-10. To save ink, print the “toddler” mat instead. Make small number cards to place on the mat for children to count, or write the number with a dry erase marker. Alternatives to play dough: If you prefer to use something other than play dough for counting practice, you could use candy hearts or heart shaped craft foams. Or, have children draw “tarts” on the baking pan with a dry erase marker. Love this idea and the pictures. Thank you! I’m in love with these!!!! I have a couple of kiddos who like to eat their play-doh so I have lots of other fun manipulatives to use with these!! I can not wait to use it tomorrow. Very sweet idea! Thanks your ideas are great and useful. Thank you for the good ideas.